Download "Division 7A Checklist 2011"
8 H3. Has a trust with an unpaid present entitlement owing to a private company (either directly or indirectly) made a payment to a shareholder, or an associate of a shareholder, of the private company (Subdivision EA)? (continued) Yes No 1. Sub section 109XA(7) defines an unrealised gain as any unrealised gain, whether of a capital or income nature. For example, a capital profit generated from the revaluation of an asset. c. Was the private company presently entitled to an amount from the net income of the trust estate (either directly or indirectly) at the time the payment was made or did the private company become presently entitled to an amount from the net income of the trust estate after the payment was made but before the earlier of the due date for lodgement and the actual date of lodgement of the trust s tax return for the current year? If the answer is no to question c, continue directly to H4. If the answer is yes to question c, continue to question d within H3. 1. From 1 July 2009, due to the application of Subdivision EB, Subdivision EA may apply where a trust makes a payment or loan, or forgives a loan, to a shareholder or an associate of a shareholder of a private company, and the company holds an unpaid present entitlement from an interposed trust which has been inserted between the first trust and the private company. This will only apply where it can be reasonably concluded that the second trust was inserted between the first trust and the private company under an arrangement solely or mainly relating to an unpaid present entitlement indirectly held by the first trust. 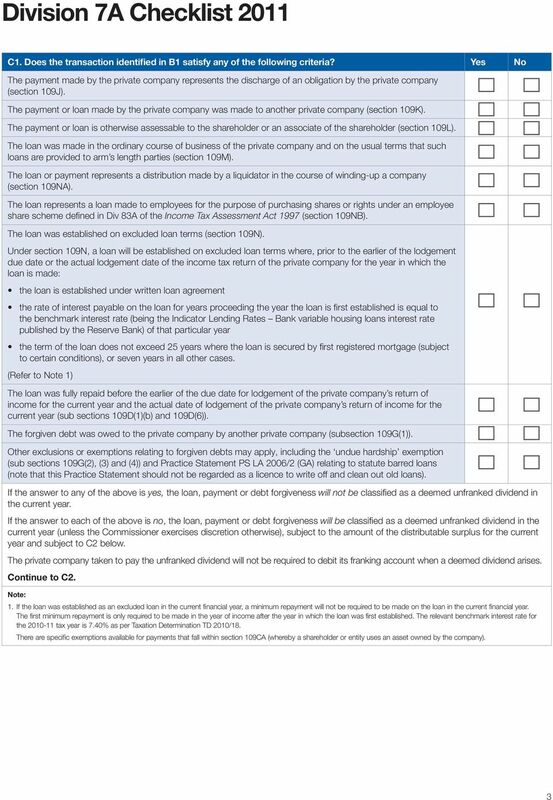 d. Was the whole amount of the present entitlement not paid to the private company from the trust estate before the earlier of the due date for lodgement and the actual date of lodgement of the trust s tax return for the current year? If the answer is no to question d, Subdivision EA will not be applicable to the payment. 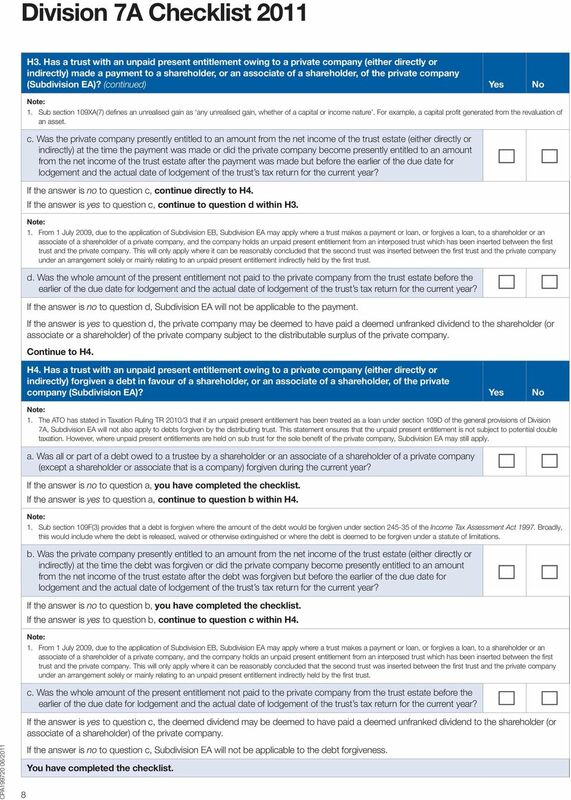 If the answer is yes to question d, the private company may be deemed to have paid a deemed unfranked dividend to the shareholder (or associate or a shareholder) of the private company subject to the distributable surplus of the private company. Continue to H4. H4. Has a trust with an unpaid present entitlement owing to a private company (either directly or indirectly) forgiven a debt in favour of a shareholder, or an associate of a shareholder, of the private company (Subdivision EA)? Yes No 1. The ATO has stated in Taxation Ruling TR 2010/3 that if an unpaid present entitlement has been treated as a loan under section 109D of the general provisions of Division 7A, Subdivision EA will not also apply to debts forgiven by the distributing trust. This statement ensures that the unpaid present entitlement is not subject to potential double taxation. However, where unpaid present entitlements are held on sub trust for the sole benefit of the private company, Subdivision EA may still apply. a. Was all or part of a debt owed to a trustee by a shareholder or an associate of a shareholder of a private company (except a shareholder or associate that is a company) forgiven during the current year? If the answer is no to question a, you have completed the checklist. If the answer is yes to question a, continue to question b within H4. 1. 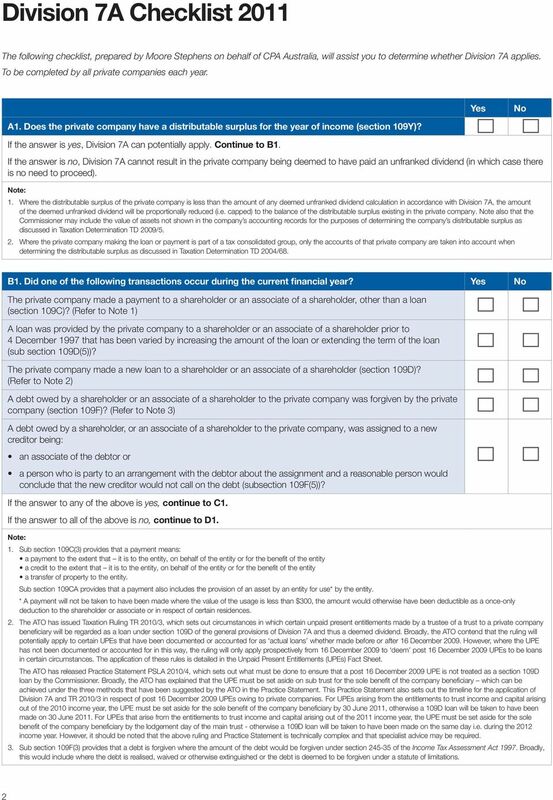 Sub section 109F(3) provides that a debt is forgiven where the amount of the debt would be forgiven under section of the Income Tax Assessment Act Broadly, this would include where the debt is released, waived or otherwise extinguished or where the debt is deemed to be forgiven under a statute of limitations. b. Was the private company presently entitled to an amount from the net income of the trust estate (either directly or indirectly) at the time the debt was forgiven or did the private company become presently entitled to an amount from the net income of the trust estate after the debt was forgiven but before the earlier of the due date for lodgement and the actual date of lodgement of the trust s tax return for the current year? If the answer is no to question b, you have completed the checklist. If the answer is yes to question b, continue to question c within H4. 1. 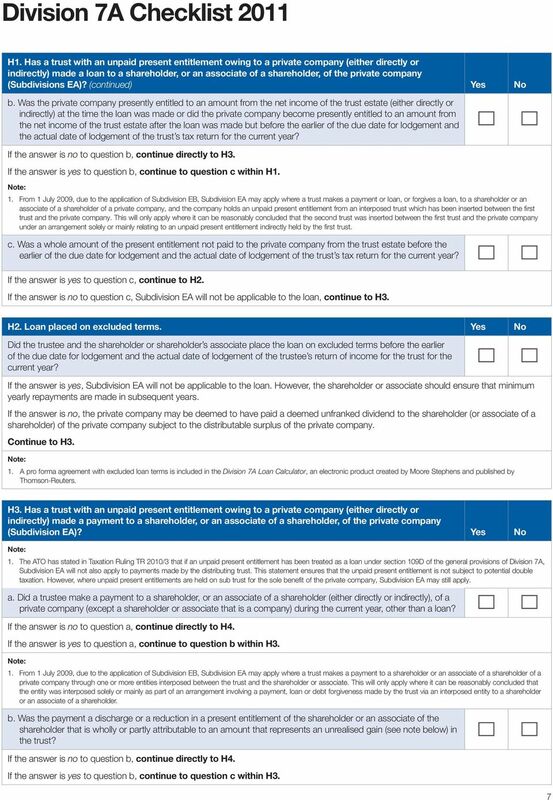 From 1 July 2009, due to the application of Subdivision EB, Subdivision EA may apply where a trust makes a payment or loan, or forgives a loan, to a shareholder or an associate of a shareholder of a private company, and the company holds an unpaid present entitlement from an interposed trust which has been inserted between the first trust and the private company. This will only apply where it can be reasonably concluded that the second trust was inserted between the first trust and the private company under an arrangement solely or mainly relating to an unpaid present entitlement indirectly held by the first trust. 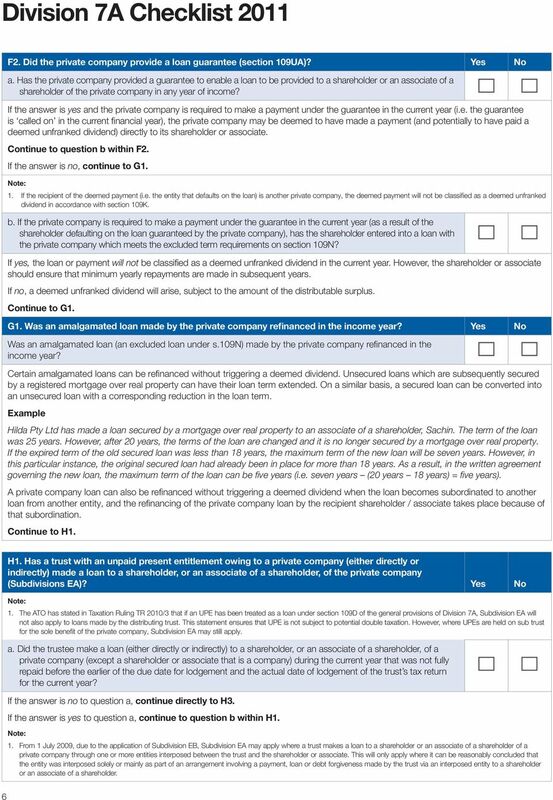 c. Was the whole amount of the present entitlement not paid to the private company from the trust estate before the earlier of the due date for lodgement and the actual date of lodgement of the trust s tax return for the current year? 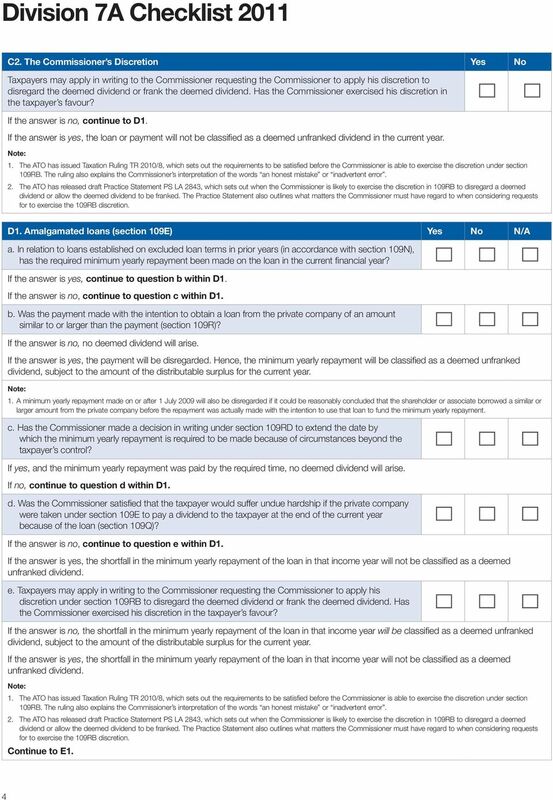 If the answer is yes to question c, the deemed dividend may be deemed to have paid a deemed unfranked dividend to the shareholder (or associate of a shareholder) of the private company. 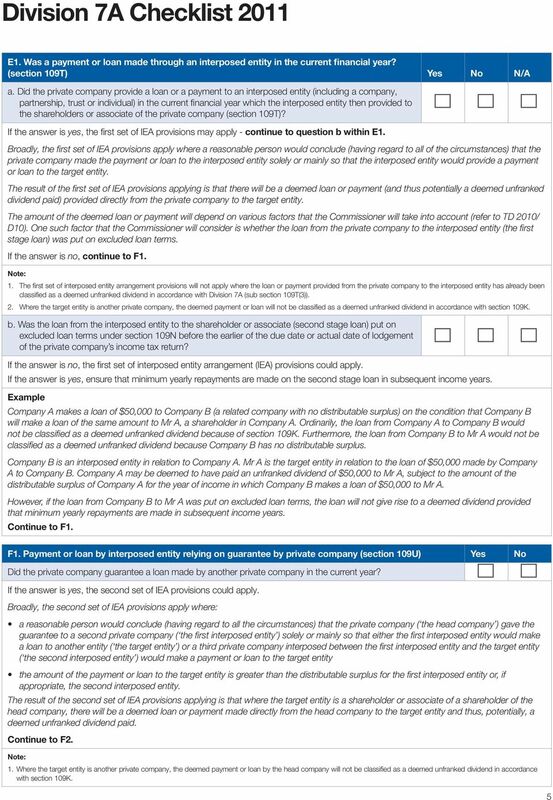 CPA / If the answer is no to question c, Subdivision EA will not be applicable to the debt forgiveness. You have completed the checklist. Client Newsletter Year End Tax Planning Checklist For the year ending 30 June 2016 For the information of clients we enclose this checklist which you may find helpful in planning your year end tax strategies. This paper is a guide as to how the broad principles recommended by the Board of Taxation might operate. General Rules 1. All income is taxable. Chapter 17 Pages 239-252 General Rules 1. All income is taxable. p. 239 2. Cancelled debt is income. 3. Cancelled debt is taxable: a. To a solvent taxpayer. b. To the extent solvency is restored. Warning! TAX 101 INTRODUCTORY LESSONS: FINANCING A U.S. SU BSIDIARY DEBT VS. EQUITY Authors Galia Antebi and Nina Krauthamer Tags Debt Equity INTRODUCTION When a foreign business contemplates operating in the U.S.